Marshall made his international bow as a 22-year-old against France in 1995 and went on to win 81 caps for the All Blacks scoring 24 Test tries. 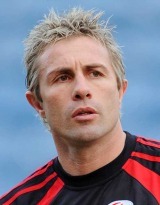 He is the third most capped New Zealand international player in history, and the most capped All Blacks scrum-half. He also featured in the 1999 and 2003 Rugby World Cups. In 1997, he became the All Blacks' 54th Test captain when he was handed the honour of leading his country on the end of year tour of the UK in the place of the injured Sean Fitzpatrick. He was also a mainstay of the Canterbury Crusaders side when it dominated Super Rugby, making more than 100 appearances. But despite being one of the franchise's greatest players and its most capped, he missed out through injuries on the 1998 final against the Blues and that of 2000 against the Brumbies. But he played in the winning finals of 1999, 2002 and 2005 and those of 2003 and 2004 when the Crusaders lost to the Blues and the Brumbies. He was also in the Canterbury sides which lifted the Ranfurly Shield in 2000 and 2004 and in the winning NPC first division sides of 1997, 2001 and 2004. His international career came to an end after the series victory over the British & Irish Lions in 2005 and he then headed to Europe where he played for for Leeds, the Ospreys, with whom he won the Magners League title, and Montpellier before joining Saracens with whom he finished his playing career. He is expected to return to New Zealand at the end of the 2009-10 season to start a new television career with Sky Sports.